Das Island Fire & Rescue Service Dennis Hydraulic Platform/Foam Tender. Perkins V8 540 Diesel Engine. Godiva GVB5300 Pump - 4500 lpm. 1100 Litres of Foam Concentrate. Due to be replaced in 2010. I must admit that I had to look to see where 'Das Island' actually was! If you didn't know better you would think it was a 'Paradise' island filled with immaculate Dennis's. The Delta III foam tender just looked extra ordinary despite being 27 years old. When these appliances come out of service it would be wonderful if they could come back home. Added by Barry on 18 February 2009. I'd agree with that Barry, there are some very interesting 'one off' appliances and all in exceptional order, perhaps the state could be 'persuaded' into sending them home for preservation ? Added by Rick Loudon on 18 February 2009. It seems that Das Island is in the Arabian states (possibly in UAE or Dubai; in my view). 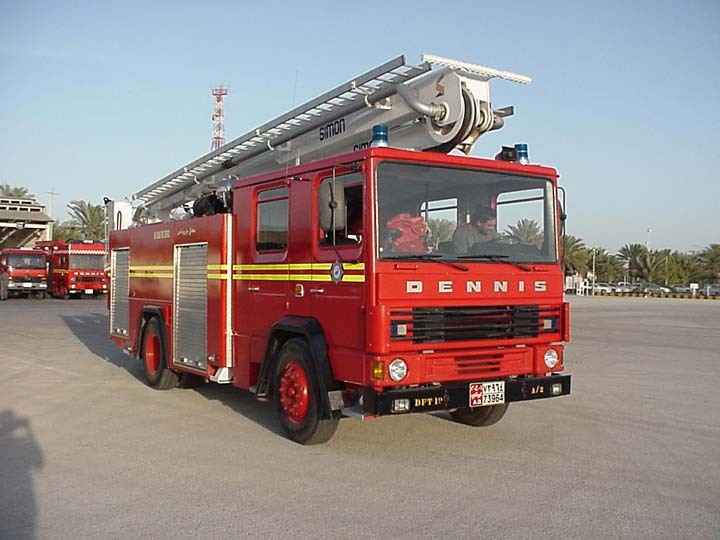 Yep, its nice to see the FS operates a fleet of Dennis appliances. I think it is a good Dennis collection as it feature a left hand drive conversion. Added by Bomba Boy on 19 February 2009. Added by Andy on 19 February 2009. Yes, Bomba Boy it's part of the U.A.E; Abu Dhabi emirate. Added by Fire995 on 19 February 2009. So did ADMA take over the operations that used to be run by BP ? Added by Ian Moore on 19 February 2009. Adma is a joint venture between bp, adnoc (abu dhabi national oil company) and total as well I think. Added by Andy on 20 February 2009. Added by Ian Moore on 21 February 2009.